Hilltown Land Trust is partnering with All Out Adventures to offer an opportunity to get outside and enjoy the mid-winter beauty of the DAR State Forest in Goshen. 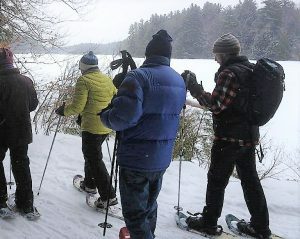 Join us for two guided snowshoe events, beginning at 10 am and 12 pm. Snowshoes and poles will be provided for those who do not have their own. Beginners are encouraged to participate. The treks are between one to three miles, with routes chosen based on the interest and ability of the group. For complete information, please go to All Out Adventures’ website and review the Senior Guided Group Snowshoeing Excursions. There is no fee to participate in this program, but donations are gratefully accepted to offset the cost. To register, click on the link below to visit All Out Adventures’ website.